What a crazy weekend! I'm not sure why, but I seem to have a habit of making really ambitious weekend plans, and come Sunday afternoon and I'm absolutely exhausted. I mean, of course there are those things most of us do on the weekends because there is simply no time during the week; like cleaning or doing loads of washing. On top of these weekly chores, however, I seem to add more and more things I'd like to get done. On this weekend's list there was the simple sounding task of sanding and painting three dining chairs, sewing a new curtain for our bathroom and, while I'm at it, why not a new runner on the dining table as well. I had also listed at least 5 dishes I wanted to cook, and of course I needed to catch up with the blogosphere as well. Anyway, so after morning exercise and cleaning, and in between getting ready to head out for dinner, I managed to squeeze in enough time to whip up this soy barley porridge I had had in my mind for a whole week. In Finland I used to make barley porridge all the time, using regular milk, but this time I've used home-made soy milk and added umeboshi for some extra tang. I fell in love with umeboshi, those sour pickles, whilst travelling in Japan, and it's delicious with this porridge! In a large saucepan, bring water to boil. Add the barley and cook for a few minutes or until the water has soaked into the barley. Add soy milk, bring to boil and let simmer on low heat for about 40 minutes. Keep stirring every so often and be careful not to let it boil over! Once the barley is tender, and the consistency is porridge-like, take the pan off the heat and add a pinch of salt. Serve with umeboshi! PS. By the way, I did end up finishing two dining chairs (though taking a short-cut and not bothering to sand them, just paint), making 3 out of about a gazillion dishes I wanted to make, finishing all washing, grocery shopping and cleaning and squeeze in a dinner with friends :-) Here's looking forward to the next weekend! 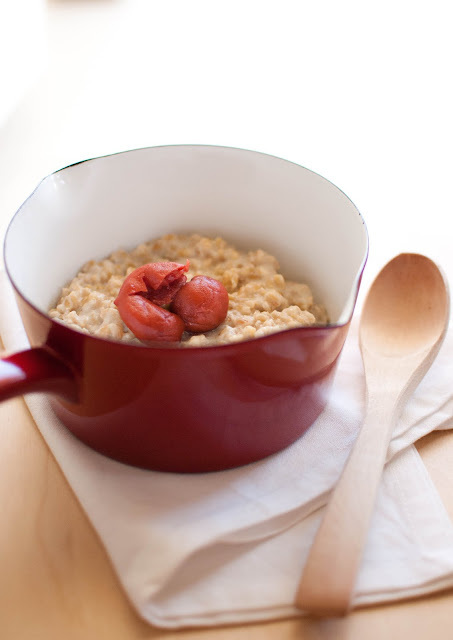 Love the umeboshi, it adds such a pretty touch to the humble porridge. That looks healthy, very nutritious and delicious! 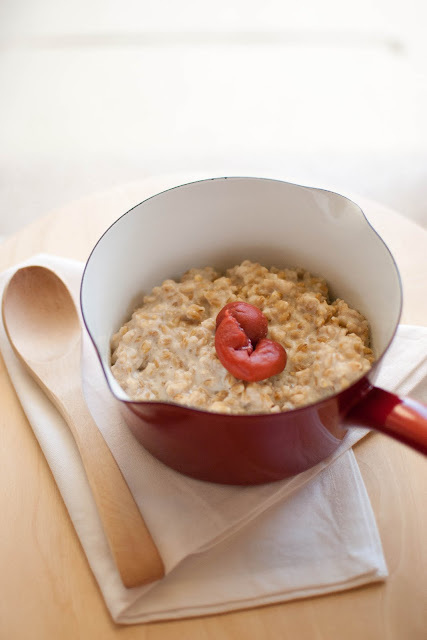 Love the healthy porridge out there, have never heard and come across this Umeboshi before! Read on Wiki and shall try to find it. i love this pearl barley with a japanese touch! umeboshi is so addictive! My weekends always end up being way busier than I ever intended as well! Craziness. I've never had umeboshi but they sell it at whole foods and I always wonder what to do with it. Now I'll have to try it in this! This delicious porridge looks like a great way to start the day! Love the addition of umeboshi! I've never had umeboshi either. Looks interesting. Very interesting way to use umeboshi! Loving all your fusion creations. That looks delicious and is that an Iittala owl bowl? They are so cute! mmmmmm I tried umeboshi wine when I was in Japan. It was so nice. Where are you sourcing all these Japanese ingredients? 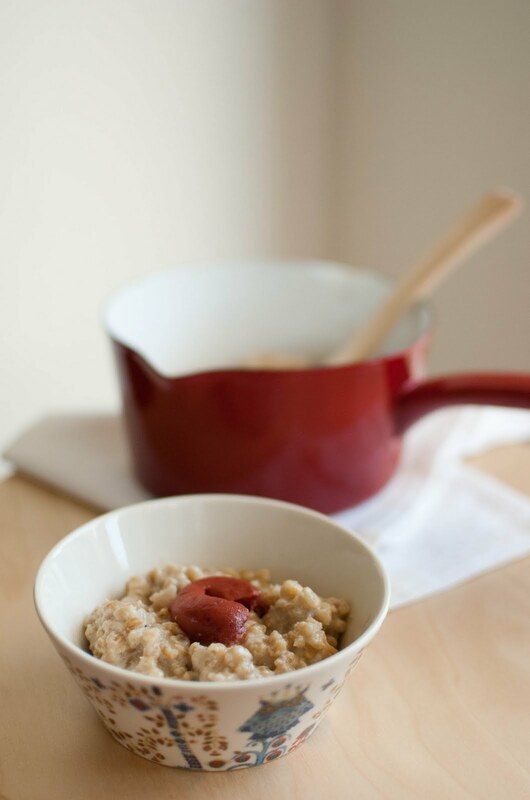 Love your breakfast barley ~ linking back to this in my next post.